Bay Area residents will soon have a new way to see the likes of Mexico City and Kabul – in a shipping container. While modest from the outside, those who enter the stranded crate in Crissy Field will immediately be connected to participants in another country. The live broadcast will allow each party to engage and interact for 20 minutes, something that is usually impossible without a plane ticket. Language barriers will also be torn down by an interpreter. The exhibit’s launch on Wednesday will begin by broadcasting to Mexico City. 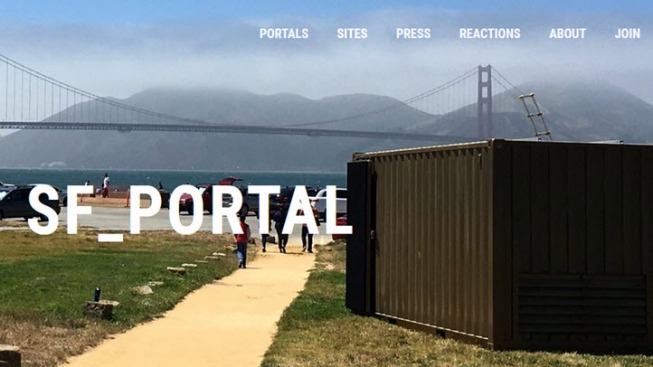 The Crissy Field portal will also be in connection with cities in Afghanistan, Honduras, Iraq, Jordan, Germany and Rwanda. The National Park Service and Golden Gate National Parks Conservatory are working together with the Portal creators to break geographic barriers. The concept was produced by Shared_Studios, who hopes that the instillation will encourage individuals to share ideas as well as craft collaborative art pieces. Shared_Studios have also announced that the San Francisco portal will be the first solar powered display. The interactive display will continue until September 24 and is free to the public. Preregistration is available on Shared_Studio’s website.